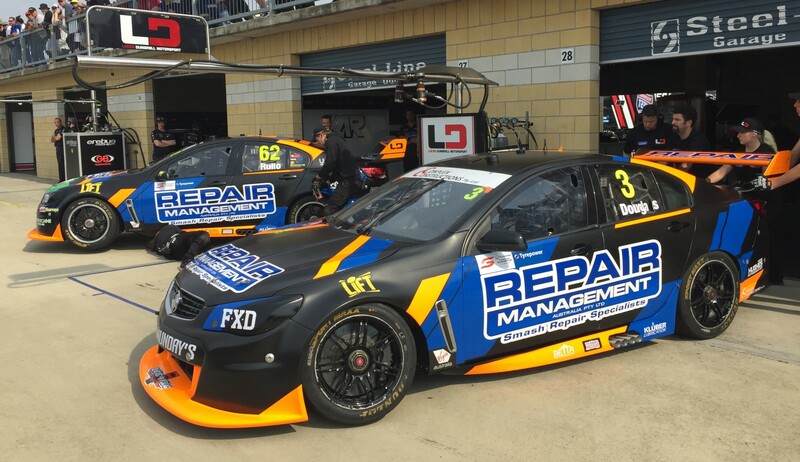 Long-time Lucas Dumbrell Motorsport backer Repair Management Australia will sponsor both of the team’s Holdens at Symmons Plains this weekend. The #3 Taz Douglas entry has adopted the same livery that has been run on the #62 Alex Rullo Commodore since the Clipsal 500. As reported earlier this week, former Supercheap Auto Bathurst 1000 podium finisher Douglas has been retained by the minnow team for a third event. This weekend marks Douglas' first time at Symmons Plains since his full season with LDM in 2012, where he qualified a fine eighth for the opening race. Other changes in the Supercars field for Tasmania sees Woodstock return to the flanks of Will Davison’s Tekno Autosports Holden. Without a full-season backer, the team has added Symmons Plains to Woodstock’s previously announced five-event deal. The Mobil 1 HSV Racing Commodores are meanwhile back in their full Mobil 1 livery following a one-off deal with Boost Mobile for Albert Park. Opening practice for the Supercars at the Tyrepower Tasmania Challenge will kick-off at 12:40pm.